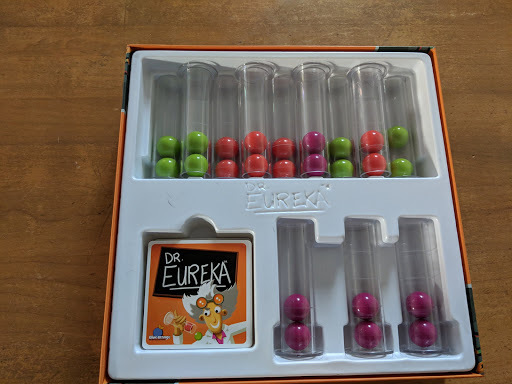 Dr Eureka is a puzzle game for 1-4 players ages 8+ that plays in about 15 minutes and can be learned in less than a minute. 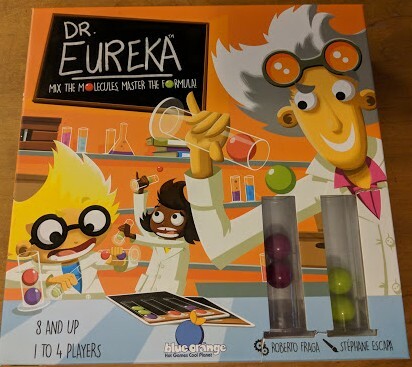 In the game players play as the laboratory assistants to the crazy Dr Eureka trying to be the first to successfully complete his experiments. 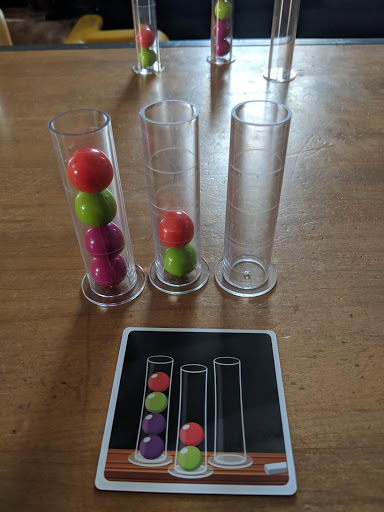 In the game each player is given a set of 3 plastic test tubes each containing 2 colored balls (Red, Gree, and Purple). 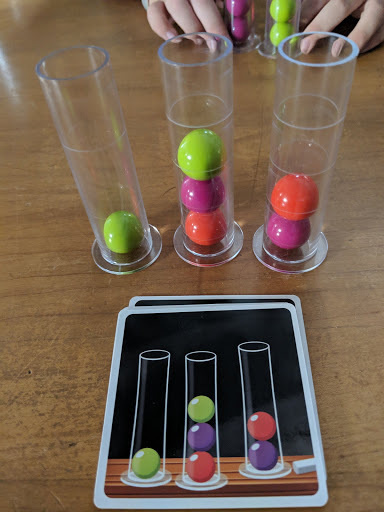 Each turn a challenge card is flipped over showing the tubes with the balls in a certain pattern and players race to be the first to complete the challenge. 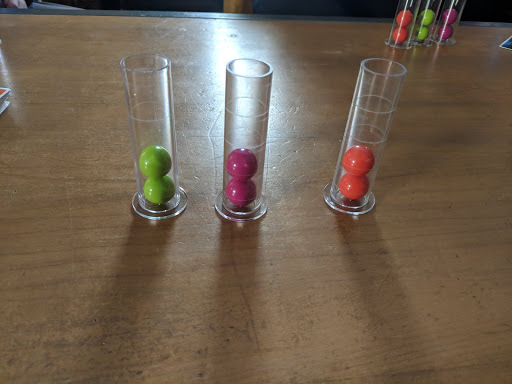 If a player drops one of the balls or touches it with their hands they are out of the round and must wait for the next challenge to begin. 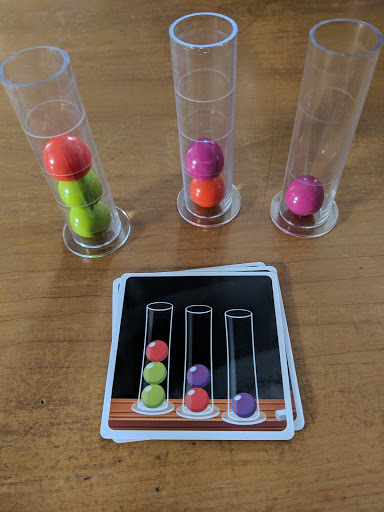 In between challenges players leave their test tubes in the positions they had them at the end of the last challenge instead of resetting them making each challenge a new puzzle to figure out. 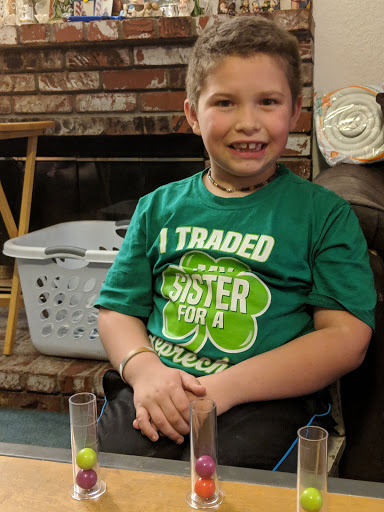 The first player to successfully complete the pattern and shout “EUREKA” wins the challenge card as a point. The first to get 5 points wins the game. 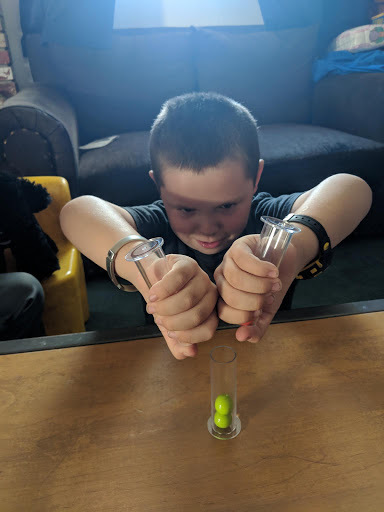 Dr Eureka is a fun mental challenge that is fun for children and adults and a challenge for everyone. I liked that there were different challenge cards, some were really easy and you could do them fast but others were harder. 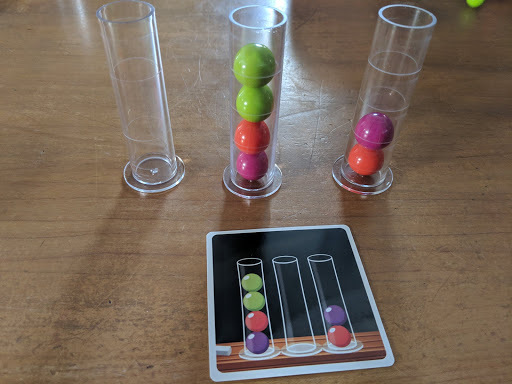 I liked that you could use your test tubes upside down if you needed to and thought the artwork was fun. I didn’t like that the marbles kept falling out of the tubes if you tried to go too fast which made it more difficult. 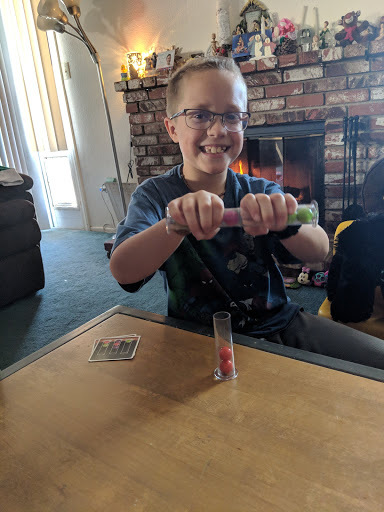 I liked the game even thought it was hard for me to get just one of the marbles into the tube while leaving another in the tube. I liked that some of the cards were easier than others so you never knew what combination you would have to make. I liked the game a lot, it was a lot of fun trying to get things in the right order as quickly as possible.